He dissemination of information by a myriad of media sources makes them a powerfulpart and rallying cry of political and diplomatic vocabulary. The advent of information super-highway, the Internet, has caused the rapid globalisation of information, rendering the world smaller and information-rich. It has become the greatest purveyor of news, views, and information in history due its instant transformational power. Its news casting routinely plays a pivotal role in highlighting and commenting upon how states perceive and pursue their national policies, self-interests, diplomacy, deal with world's trouble spots, and inter-state relations. On many such pressing issues of intense global public interest, the silence of the mainstream media may be attributable to strict censorship or toeing to their government lines for various reasons. Despite clamp down on Internet news content, bloggers in the recent past covered popular uprisings in Zimbabwe, Burma, China, Pakistan, and Iran, where most other sources of information were cut off. This new form of coverage underscores the significance of the Internet as an alternative source of information and avenue for the freedom of expression. Wikileaks is one of such cyber news and information providers, which has been revealing many uncomfortable truths about the governance of our unipolar world dominated by a single superpower. In this new world, there is a coalition of hierarchical powerful states, which enjoy a self-perpetuating image of benevolent leaders in global rule-making and standard-setting, implemented selectively to advance their self-interests often through military might and economic coercions. These states treat themselves more equal than others. The states that are not enamored with this hegemonic power have become less sovereign and encounter marginalisation. The situation has worsened since the September-Eleven. A pervasive culture of impunity has emerged where violations of legal rights and principles are overlooked or made subservient to political and military agendas. Most states with their limited powers are overwhelmed by the power of, and cannot exert any influence on, the coalition of powerful states. It is this situation that has heightened the need for alternative media sources to disseminate information of global interest not otherwise available. As a result, a wide range of Internet networks proliferate and operate daily in this information-rich environment to confront human rights predators and protect minimum conditions for dignified human existence worldwide. Wikileaks revelations have stormed the protective immunity of national security and secrecy to unveil many illegal and unacceptable acts that the coalition of powerful states has grossly and persistently been committing with impunity. It represents the first ever sustained challenge to the established order and its impunity. This is why the powerful states are so intolerant of Wikileaks, which bears the full brunt of power-sponsored vicious and coordinated attacks, but not all major mainstream media that also published the same information. Freedom of the press and freedom of expression are mutually supportive. Media freedom faces an uneasy coexistence with the new state security paradigm. Most states' security plans, actions, and measures are sensitive, classified, and inaccessible on the pretext that they are about national security and fighting terrorism. This dominant rubric of security has given governments more power to control the media and blocked access to official information by silencing their whistleblowers from revealing embarrassing national secrets. Grigory Pasko faced charges for his coverage of Russia's under-maintained nuclear powered naval vessels and waste disposal. The execution of Nigerian activist Ken Saro-Wiwa illustrated the danger in exposing government and corporate allied secret wrongdoings. These are indicative of the desultory attitude of many governments toward freedom of the press and expression. The freedom of expression is a human right recognised in Article 18 of the Universal Declaration of Human Rights (UDHR) and is reproduced in many international and national human rights instruments. Its eloquent and persuasive language comforts the oppressed and confronts the oppressor. The media are important vehicles for the exercise of freedom of expression, which warrants us to listen to things that we dislike or views that we disagree. Freedom of expression must be guarded against its deniers and suppressers. The US-led coalition of powerful states purports to be the champion of freedom of expression, the apparent lack of which is often used against others, notably China and Iran. On 21 January 2009, Hillary Clinton as a rebuke to Chinese cyber attack on Google said about Internet freedom: “Information has never been so free. Even in authoritarian countries, information networks are helping people to discover new facts and making governments more accountable”. During his China visit in November 2009, Barak Obama defended the right of people to freely access information and said: “the more freely information flows, the stronger societies become...access to information helps citizens to hold their governments accountable, generates new ideas, and encourage creativity, and the US belief in that truth is what brings me here today”. The US Supreme Court in the Pentagon Papers case held that “only a free and unrestrained press can effectively expose deception in government”. Ironically, the truth hurts even liberal democracies of the west, which are now desperate to get rid of Wikileaks that comprehensively exposes the blatant lies of these democratic leaders to their own people and the world to bluster their predominance. Their citizens have needlessly been sacrificing their lives and taxpayers funding these lies and reckless militarism with no accountability whatsoever. Wikileaks has made this truth abundantly clear to their citizens, who are now increasingly calling their government to account. It is not the revelation of confidential information and national security that the US-led coalition is fighting for. Rather they are trying to conceal their irresponsibility, irrationality, embarrassment, and accountability from global public scrutiny. Disclosures beget accountability. In this pursuit, Wikileaks has succeeded where liberal democracies have failed. Matters revealed in Wikileaks are genuinely in the public interest, the lack of which can dangerously cloak state illegality and shield government lawlessness. The Guardian newspaper on 28 November 2010 reported that US diplomats spied on key UN officials including the Secretary General under the name of Hillary Clinton in July 2009 (sent to US missons at the UN headquarters and 33 embassies/consulates). It revealed that the US state department issued at least 9 such directives to US embassies around the world. Who should be charged for alleged espionage: the whistleblower Wikileaks or the US state department? The media organise and harness international public opinion across state frontiers against acts and events that undermine international law and obligations. A plethora of persuasive media initiatives are now in operation to mobilize and globalise shame and embarrassment in a bid to incriminate particular regimes, denounce derogatory acts, and scandalize events by their fact-finding and surveillance reporting. Such incriminating evidence often helps the world watching, offends its moral feeling, outrages it, and assaults its sense of propriety. This informed world opinion visibly has impacted on the global public image and power structure of the so-called coalition of the willing. 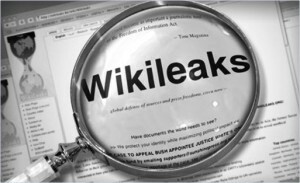 The worldwide consciousness-raising campaign for just global governance by the media such as Wikileaks has created a powerful transnational space of public opinion. The people of the world have recourse to ventilate their voices for political correctness and fairness in dealing with issues of global public interest. This media-public alliance, however imperfect, pragmatic, or rudimentary, coalesces to flash out human miseries and protect victims of violations of international obligations in many instances where silence would otherwise have prevailed. In the international system that lacks a mandatory and centralized enforcement mechanism, media-induced world public opinion remains the main hope for a just world order. In this state-centric international order, states invariably act in their self-interest. The interest of states and their people, though not always mutually exclusive, may be different in many instances. States often fail to harmonise their interest with that of people and reorient their focus to be inclusive of peoples. This has caused a disjunction between the aspirations of people and the international system of states and circumvented the identification of people traversing national borders and their capacity to participate in internationalism. This explains why violations of human rights continue unabated despite the plethora of human rights principles, treaties, norms, and standards. Human rights NGOs have been formed partly as a reaction to the inability of the international human rights system to protect and promote human rights and partly due to the emergence of new social movements consciously concerned with issues of people to contra wayward and stuborn state interests. Concern for the environment, equality of women, disarmament, poverty, human rights etc would not have been on the international agenda without the backdrop of their social and political understandings promoted by the media. The mass media like Wikileaks purport to heal this disjunction by establishing a connection between the people and reasoned internationalism. The daunting challenge for this global power reconfiguration is to mobilise and consolidate further the discursive and institutional structures of the new information outlet to defend its right to reveal the truth, however inconvenient. In this challenge, the world is set to watch the Internet media as much as the Internet media watch the world.